A solemn celebration of the feast of Christ the King was held on November 22 in the province of Ilocos Norte. The venue of the event this year was at Brgy. Madiladig in Laoag City. It was attended by all the parishes in the province. The Solemnity of Christ the King was established on March 11, 1925 by Pope Pius XI. This celebration was made in response to growing nationalism and secularism. Christ the King is the last holy Sunday of the liturgical calendar. This celebration commemorates the divine Kingship of Jesus Christ. He is being honored as the king of creation and the universe. This event is being simultaneously celebrated worldwide by the Christian faith. It usually falls on a Sunday between November 20 and 26 every year. 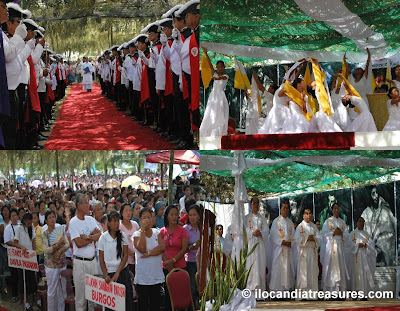 A long preparation was made by the host Divine Mercy Parish of Laoag City, Ilocos Norte headed by Fr. Tranqui in partnership with the Redemptorist Ilocos Mission Team headed by Bro. Joel and Fr. Dennis to realize a successful event. There were mini-Cristoreys that were held prior to the main event. In fact I was invited and had attended one of them. There was nine-day novena, masses, processions, benedictions, and many other religious activities. The big venue was at purok Baldias at Madiladig where this is a part of the sand dunes. They prepared make-shift altar and large shed made of bamboo and its leaves. It was windy so it was not that hot. There was a royal entrance of the clergy with the Knights of Columbus acting as guards on the sides. One by one, the priests walked on the red carpet towards the stage. It was started with the singing of the theme song Cristo nga Ari sang by the parish choir and interpreted by young dancers from the same parish. The mass was celebrated by Bishop Sergio Utleg. The very hightlight of the celebration was the general precession from Madiladig to Caoacan and back. The monstrance was paraded around held by the bishop alternated by other priests. They used the simple monstrance because it is light in weight. But I have seen the solar monstrance paraded during the mini-Cristorey which really looks heavy. Monstrance is the vessel used in the Roman Catholic Churches to display the consecrated Eucharistic Host. It comes from the Latin word monstrare meaning “to show” or synonymous to demonstrate, to show clearly. Monstrance is also known as ostensorium.